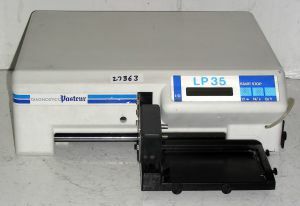 Product Description The Sanofi Pasteur (Anthos, Kallestad) LP35 Microplate Washer can be equipped with 3 different manifolds: 8 well, 12 well or 16 well. The aspiration distribution system is attached to the bottles containing the washing solution and rinsing solution. A filter between the suction pump and the recovery bottle prevents any reflux of the liquid inside the Instrument. The pumps are integrated into the apparatus. The very easy to use program can Store up to 20 different tests. the power of the suction pump. This entirely unique washing protocol creates a whirlpool at the base of the well. lt is very effective and ensures perfect washing of the microplates regardless of the immunoenzymatic model used.